We had a great first meeting at Christian Brothers University, they’re graciously allowing us to use one of their classrooms and we were able to have our first presentation. 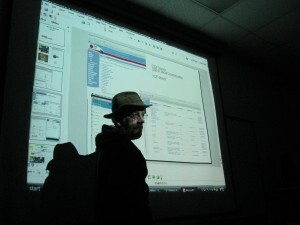 Rick Mayfield shared his great Arduino presentation. Rick also brought some of his DIY projects including a light made from bright LEDs as well as a USB LED light. The rest of our pictures have been uploaded to our Facebook Pictures.